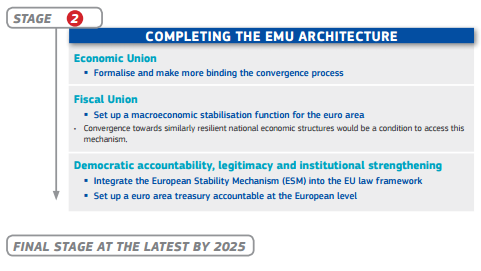 In the midst of the ongoing bailout nonsense negotiations with Greece, the long-awaited roadmap document for the future of the European economic and monetary union was released earlier this week (here). It comes over 18 months after the original “Four Presidents” report of November 2012 (here), with the Commission taking the baton from the Council in writing/coordinating contributions. They have also managed to add another President to the original line-up, the President of the European Parliament (with the Presidents of the Eurogroup and the ECB making up the final two places). Over the past few months, Draghi has been promoting this report as laying out the “quantum leap” that the EA needs to deliver increased shared sovereignty. So does it deliver? And does it do it on an appropriate timetable? In my opinion, this is a deeply disappointing report. It contains very little (in fact almost none) in the way of new proposals, and the timetable is stretched out another two years for completing the Banking Union and a decade for Fiscal Union. The fact that so little has changed from the Dec 2012 report shows that the answers are not really the issue here. The technocrats are largely in agreement. It is the political will to move forward (in the near-term) that is at issue. I guess this is Draghi’s “quantum leap”. The significance of this should not be lost, particularly on those who reside outside Europe. It is the basis for what the European elite/technocrats have been trying to achieve since the end of the war. It is why (in my opinion) a solution will ultimately be found for the Greek situation, and why comments like the euro being irreversible are really meant by those who say them. The “project” is deeply ingrained in those in Brussels (and Frankfurt, Strasbourg and Luxembourg). That is why I also think that further integration should come with time, but if the crisis continues to abate, time may actually be against those currently overseeing the “project”. That is because it is much less clear if it is quite so ingrained in the general population of Europe. In particular, younger generations, rather than embracing the “project” to become European citizens, have instead become more nationalistic/separatist than their parents (perhaps unsurprising given they have suffered most in the financial crisis). If the European leaders of today fail to turn that feeling around, then there may be graver times ahead for the Union. But leaving that big issue to one side, and focusing on the report itself, what are the key recommendations? In the remainder of this post I am going to focus on just the financial and fiscal union (these are crucial in dealing with a crisis, while the economic union and democratic accountability etc are more about preventing crisis). In a nutshell, this is the unfinished business of the Banking Union. Already behind schedule, the Banking Union remains incomplete as the Single Resolution Mechanism (SRM) has not been fully implemented, the Single Resolution Fund (SRF) has not yet come into force (and is unfunded) and national deposit guarantee schemes have not been aligned, let alone merged into a EA fund. The 2012 report envisioned all of these elements would be in place by end-2014. Assuming the SRM will be transposed into national laws by all member states, the main outstanding issues is the SRF and deposit guarantee scheme. The SRF (which would provide financing to a failing/failed bank in the EA during the resolution process) is due to become operational at the start of 2016. However, at this time there is no agreement on a credible financial backstop for the period it will take to adequately capitalise the fund by the financial industry (8 years). Of course the reason this has yet to be agreed is that it is, in effect, an EA risk mutualisation fund, something that the northern European countries remain very reluctant to do (at least in the near-term). The report suggests that the ESM could provide such a backstop, but of course, the ESM is backstopped by national governments. Thankfully the Greek situation by itself is sufficiently small (financially) to not be a problem on this front, but in the unlikely event of Grexit, should there be contagion to larger banks in Spain or Italy, then the failure to already agree this backstop my come back to haunt those delaying it. The report proposes the establishment of a European Deposit Insurance Scheme (EDIS), in order to break the link between sovereign risk and bank risk. Again, this is a key pillar of financial union that is being held up by those who are not ready to accept mutualisation of sovereign risk (as the Scheme would need a fiscal backstop, at least for the next 10 years, even though the banking industry would ultimately provide the funding). The report is silent on whether a backstopped EDIS or SRF would require Treaty change. No doubt the German Constitutional Court would once again be partitioned to rule on its legality there. Finally, the report says that there should be consideration of large exposure limits for banks holding local sovereign debt. But is clear that this will come with international (Basel IV?) reform rather than the Europeans going it alone. This effectively kicks it into the long grass in my opinion, as the Japanese will block it for as long as they can. 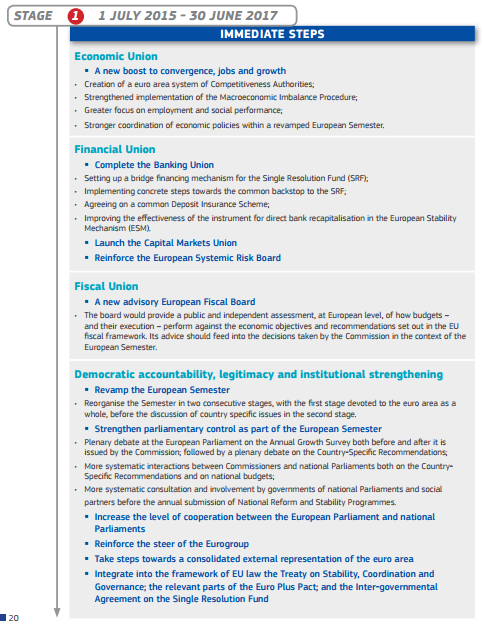 So in summary, there is really nothing very new in this report with regards to financial union. It is mainly a re-statement of what has previously been identified as necessary to take further steps towards fiscal mutualisation. So while the prescription is unchanged, when will the patient(s) accept that they need to take the medicine? The chapter on fiscal union suggests something that was also in the 2012 report, which again goes further down the line of mutualising risk across the EA. It suggests a euro-area wide fiscal stabilisation function, which could be called upon in extreme cases where national automatic fiscal stabilisers are insufficient. As a pre-condition, amongst other things, it would require further coordination and pooling of decision-making on national budgets (ie working with the Commission). The report describes this as a Stage 2 objective, ie at some point in the next decade, but not the next couple of years. Very little detail is given, with the report saying more work is needed in this area. Indeed the 2012 report gave more detail on what this function might look like! But they suggest that initially it could come via the European Fund for Strategic Investments (the precise status of this fund is actually pretty unclear, as it is meant to incentivise private investment through relatively small commitment of public money). But it goes on to say that the stabilisation function would not be a crisis management tool (for which the ESM is in place), but rather something that is intended to prevent crisis and use of the ESM. If you like, a first firewall before things get really bad. Of course the big question is how big it should be, as anything tokenistic – like the EFSI – would be pretty pointless. So again, in summary, there is really very little new in the fiscal union chapter, with less detail suggesting push-back from the 2012 document.